I have made a pilgrimage for my craft and it was good. Yesterday, Maryse and I bundled into the car, braved sleet and snow and drove a couple hours out to Northampton to Webs. Oh lordy, it was just as I'd imagined. The shop itself was great, everything you could want that had to do with knitting. Bags, needles, DVDs, weird notions you've never seen before, and a tonne of staff on the floor ready and able to help should you have a question. This week they're having a Boxing Week sale (they call it something else. 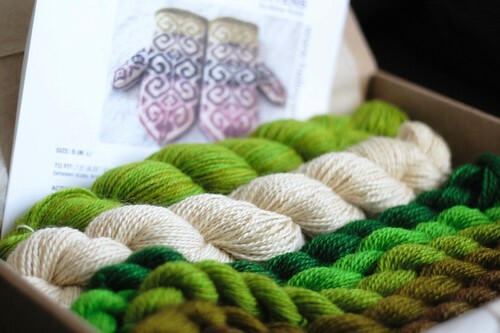 To me, it's Boxing Week) and I scored some good deals on some new yarn. The main part of the shop is fantastic but I think that if you time it right by the season, the magic happens in the warehouse in back. It's like the Costco for yarn back there. You're never sure quite what's in stock but when you find something, grab it. Who knows if it will still be there when you return. I didn't pull the trigger on anything in the warehouse this time, but I'm going to troll through again next time. 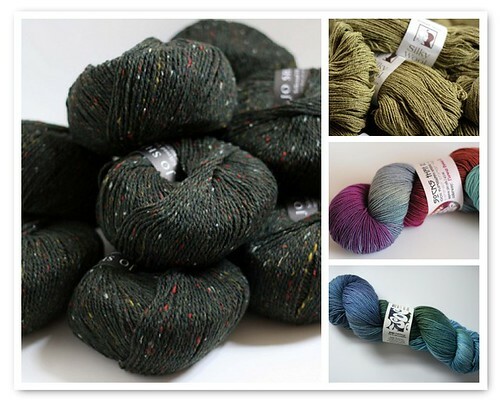 I *knew* I should have nabbed that green Kathmandu Aran bag when I saw it. 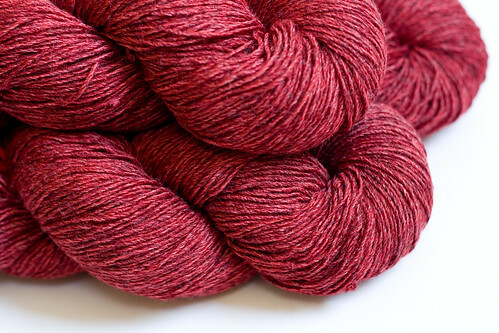 Rowan Scottish Tweed Aran for the CPH. I'm comin' for ya Meg. 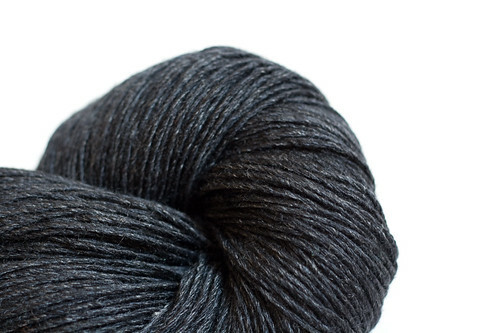 If you're a knitter, you've probably heard some of the buzz about Ravelry. I weasled an invite from Maryse the other day and let me tell ya, I'm in LOVE. 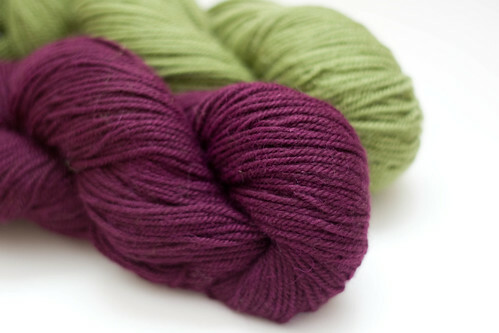 (With Ravelry, not Maryse. She's delightful, but I'm a married woman.) They're adding new users every day and I highly recommend signing up for an invite. It's still in beta, but damn, it's goooood. 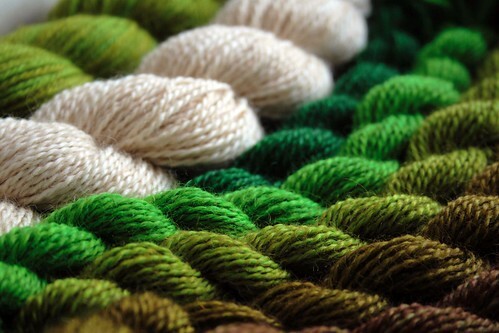 If you're looking to start a new project, Ravelry will be the place to go. Yarn information, patterns, other folks FOs, it's all there. If you want to see a completed Central Park Hoody and want to know who else has knit it and what yarn they used, it's all in one place. This is going to save me a ton of googling and flickr time when I'm looking for inspiration, samples of completed work or searching for a good yarn substitution. I spent the weekend uploading most of my projects and finished objects to my Ravelry notebook. I even went back through my stash and photographed it all so I could prettify my stash page. Dig the needle inventory! You can download it to a .pdf to print it out. Brilliant! Uploading all that information motivated me not only to get organized online, but in my studio too. When I finish something, I usually shove the pattern notes in a drawer to be 'organized later.' Turns out, Later was last night. Aaah, stapled, complete, and filed. Almost as good as finishing the project itself! Quick TV note: If you missed the airing of the Crafty Bucket episode of Uncommon Threads last time, it will be on HGTV Thursday morning (May 10th.) Check your local listings. If you do watch, try not to cringe when I say "paincil" instead of pencil. I was SO hoping that I'd be the only one to catch it, but Meg totally busted me. I sometimes mix words together when I'm thinking faster than I can speak, but pain-cil? Sheesh! I'm only working a few mornings a week right now, so I've been trying to walk every day for at least 30 minutes when I get home. I put on the headphones, fire up the ipod and off I go. Yesterday's listening selection was the first episode of the Stash and Burn podcast. With all the talk on the blogs about stash reduction, these women have begun podcasting about their attempts to get their stash under control. I found it seriously motivational. So much so it was tough to stay out walking for the full 30 minutes. I had to restrain myself from taking a shortcut through the neighbours yard to get home and dig out all my yarn. My pace quickened and as soon as I walked in the door, I dove right in. So this is it*. 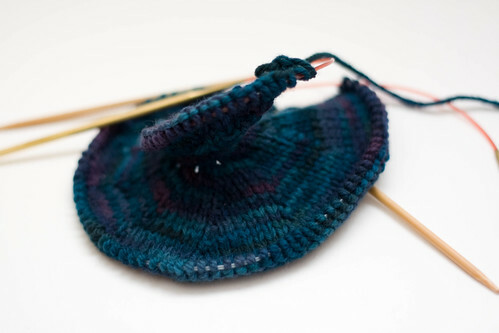 This is all the yarn I've got. I divided it into two plastic filing bins, Active Yarn and Stash Yarn. The Active bin is all the yarn for projects currently on the needles, the Stash bin is, well, stash. Duh. I feel infinitely lighter for getting it all in one place and documenting it all. I have no guilt about anything that I've kept. 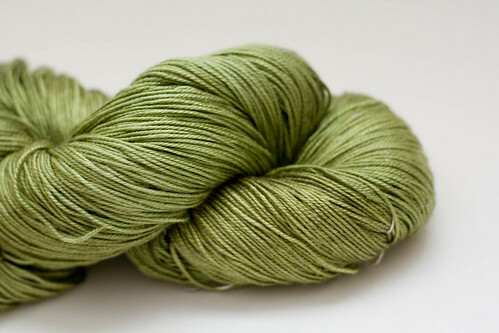 If you're interested in what each yarn is and what the slated project might be, I'm putting notes on it all over on Flickr. 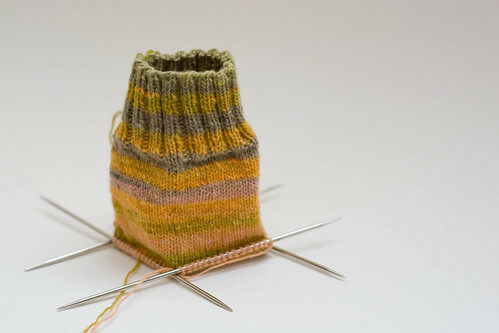 Probably a good thing that I got all this done before the first Rockin’ Sock Club shipment arrives, eh? Later this week: the WIP pile and the RIP pile. *not pictured: 2 bags of 1970's aran fisherman-cream coloured acrylic donated to me by Mum. It still counts as stash, but it's not pretty enough for the pics. Destined to be Starsky and Trellis. Last October I wasn't yet a sock knitter (oh how I have seen the folly of my ways) but this year I am gung ho for Socktoberfest (along with over 1500 other knitters!) 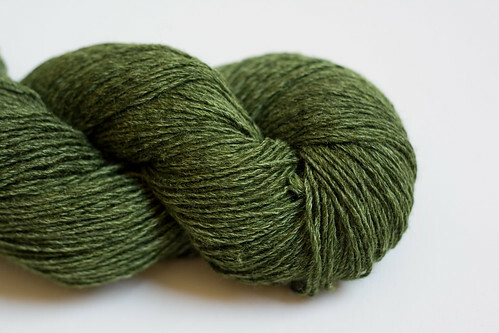 With perfect timing, my new skein of Vesper sock yarn arrived (Strange Little Mama colourway.) It's hard to get your hands on the Vesper because it sells out so fast, but when you do, it's worth the wait. Pink, black and red is one of my favourite colour combos so at this point I'm thinking these socks will be for me*. 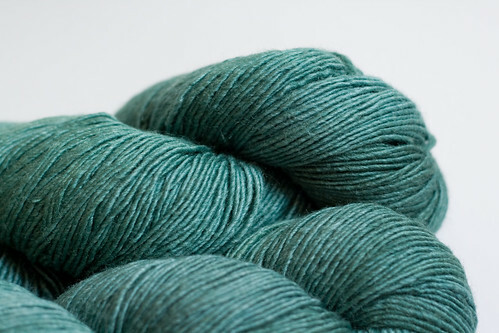 I'm going to try out the Dublin Bay pattern (PDF is here) after seeing Good to be Girl's WIP photo. They look fantastic. *I had considered working these up for one of my best friends for her birthday, but she's just moved to Australia from Vancouver so she's going into summer. I hardly think she'll need wool socks in Sydney for Christmas; I'll have to come up with an alternative present. It's her birthday today, so go wish her a happy birthday (or take her out for a beer if you're in Sydney - I'll sponsor!) Have manybeers Melmel and pretend they're all from me. Mwah! Ever since I discovered that Zipperstop (warning: music) sells on ebay I'm always over there trolling for deals. Last week I caved and bought many many many zippers. $10 for 100 zips! Awesome deal. They were barely out of the envelope before I resorted them by colour, took a couple of quick pictures and then started on the atomic blue wristlets. I can hardly contain myself. It will be a jam-packed uber busy weekend, but I'm going to try and squeeze in some beers and knitting downtown on Sunday afternoon. Anybody want to come with? Ping me and I'll set something up! 25 multicoloured seven inch zippers for 99 cents. As we say in my family, "helluvadeal." I see many, many zip pouches in my future.